Over the past decade or so, Paddy Power’s popularity has simply exploded. In large part, this has been down to incredible marketing campaigns. Across both traditional and social media, Paddy Power have grabbed people’s attention with their humorous, light-hearted adverts. The thing is that, once somebody’s actually signed up for a bookmaker, those adverts instantly become irrelevant. At that point, a punter needs to find substance underneath the style. That’s the question we’ll be seeking to answer in this Paddy Power football betting review. We’ll look at their promotions, mobile app, the quality of the football section, and much more. Even the biggest bookmakers want to keep on growing. A killer sign up offer is a great way to do exactly that, by attracting brand new customers who simply can’t resist. The Paddy Power new customer offer nails it in this regard. 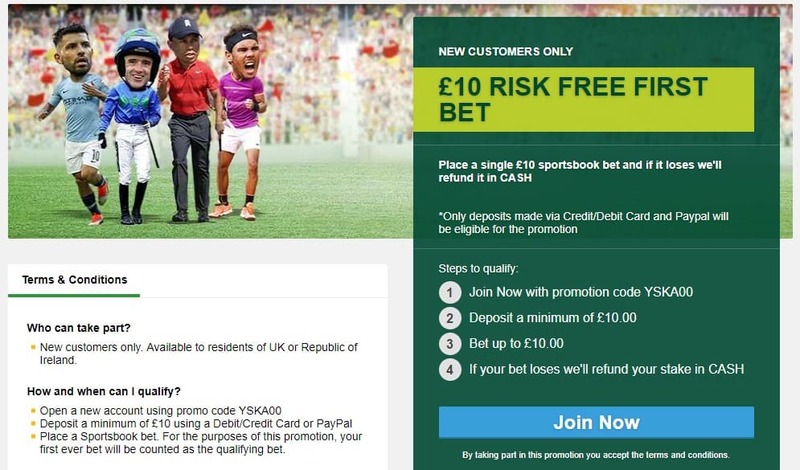 The current £10 Risk Free First Bet is one that many people will find it hard to say no to. In short, you place a single £10 bet. If it loses, you get the whole £10 returned to you. Not only that, but you get it in cash, rather than free bets. And that’s about it! There are no stipulations on qualifying odds, nor on the markets you can bet on. This is as close to a no-strings-attached sign up offer as you can get. There are other offers out there which might give you bigger returns. This offer is all about playing it safe. Stick a tenner down when you sign up, and you literally can’t lose. What’s not to like?! The list of ongoing Paddy Power promotions is both extensive, and of a high quality. We counted 11 sports betting offers at the time of writing. These varied nicely between mid-to-long term deals, and those which were event-specific. In fact, the quality is so consistently high that it’s hard to know which to single out. Paddy’s Reward Club is certainly an eye-catcher. Place five bets of at least £10 within a month, at minimum odds of 1/2, and you’ll be rewarded with a £10 Paddy Power free bet. That lengthy, month-long time frame means even casual punters can easily take advantage. For football fans, arguably the most attractive Paddy Power offer is “2 Up – You Win!”. If the team you’ve backed goes up at least two goals at any point in the match, you automatically win your bet. That’s available on Premier League, La Liga and Champions League group games. Finally, The brand is looking to increase their user numbers even further with their cheekily-titled “Friends With Benefits” offer. If you get a friend to join up, and they place five or more bets of at least £5 within two weeks, you can get up to a whopping £50 in free bets. Other markets are important of course, and we’ll get to those in more detail in the next section… but there’s no doubting what the king of sports is when it comes to betting. Football reigns supreme, and will do for a long time to come. Football features are a huge part of Paddy Power’s offering, as you would expect. 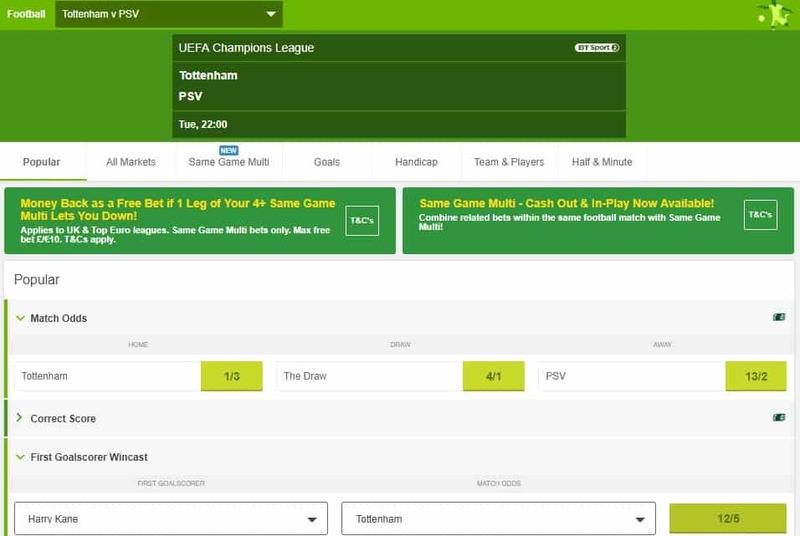 There’s an absolutely enormous range of markets within the football section, including apparently every live game in the world, plus those which are upcoming. Paddy Power football section also boost the odds on certain specials bets, courtesy of their Power Prices feature. There are also plenty of longer-term outright bets (league winners, top goalscorers, and so on), and some interesting outright specials (like betting on a team to go unbeaten in the league). In-play betting – a key part of modern-day gambling – works flawlessly. Odds are updated pretty regularly, and – when you’ve found a bet you like – it takes a mere moment to be processed. The Paddy Power cash out feature works similarly smoothly. You might think that’s already a pretty good selection of features… but there’s more! Paddy Power also offers live streaming of football from across the globe. Anyone with a positive account balance can use the service, and it works extremely well. The player loads quickly, and the stream is clear and quick. Our only gripe with the entire section regards the layout. The mostly-grey colour scheme simply looks a bit dull. Section titles don’t really stand out from the teams, for example, and it generally has a slightly unprofessional appearance. These are only visual complaints, however, because the design of the section is intuitive and easy to navigate. Overall, Paddy Power have catered extremely well for the many football fans using their service. Football may inarguably be the dominant sport in betting, but Paddy Power certainly don’t slack on their commitment to other sports. Fans of horse racing will be particularly pleased with the promotions on offer for them, which include various money-back specials. In-play betting is available for golf, tennis, basketball, eSports, and essentially any other live event that’s taking place. It works just as smoothly as it does in the football section, too. As for upcoming events, every major sport you can imagine is covered – boxing, cricket, rugby, winter sports, and so on. As you can probably guess, Paddy Power also stay true to their Irish roots with a solid Gaelic Games sub-section. For obvious reasons, mobile betting apps are incredibly important to modern bookmakers. It’s not enough just to have one, though, and it hasn’t been for a long time. The app has to be really, really good too. It’s fortunate, then, that the Paddy Power app is really, really good. The appearance of the interface – which we criticised a little earlier – actually looks better on a mobile device than on a desktop screen. Navigating it is extremely easy too, courtesy of a handy bar along the bottom and a drop-down menu at the top. Both of these take you to essentially every area you’re likely to need, whether it relate to actual betting or account management. In terms of its performance, the Paddy Power mobile app worked brilliantly for us, with everything loading nice and quickly. There have been a few complaints that it freezes online, but we experienced nothing of the sort. Even the streaming service – which is also available on the app – loaded and played pleasingly smoothly. 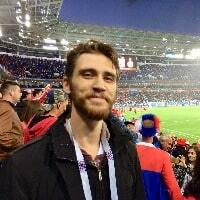 User reviews have been similarly positive. The Paddy Power Android app has an average rating of 4* on Google Play. The iOS app has been even better received, with over 43K users giving it an average score of 4.6/5 on the App Store. 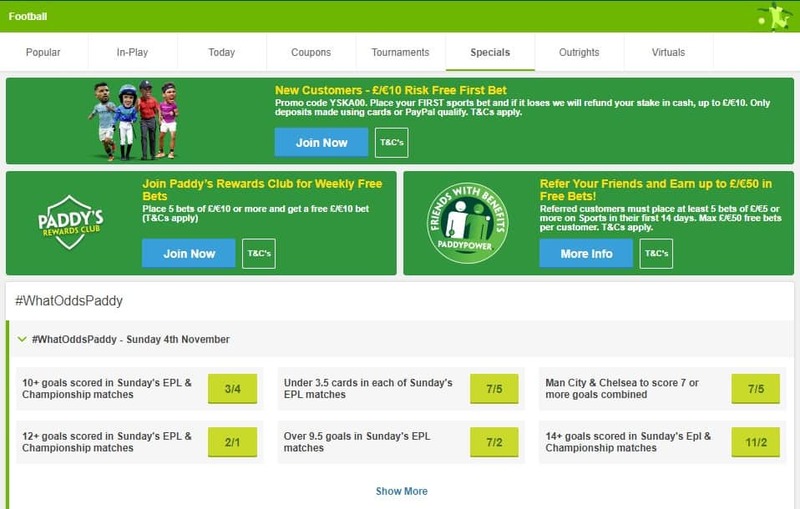 To their credit, Paddy Power’s customer service team have actually done a good job of answering any users who’ve had problems on those sites, directing them to the relevant support channel. In the competitive modern market of mobile apps, Paddy Power’s offering is right at the top of the pile. Okay, so the question “Is Paddy Power legit?” might seem a bit redundant. They’re a big bookie, and everybody knows them… in short, yes, they clearly are legit. That doesn’t mean, however, that you can’t still take a healthy interest in their security features! You want to make sure your personal data, and your hard-earned cash, are both fully protected after all. In a dedicated section on the website, Paddy Power gives a reasonable amount of information about their security measures. They help to protect customers’ identities by storing personal documents offline, and all transactions are processed with 128 bit SSL encryption. They also fully comply with data protection laws, and carry out random credit card checks to ensure they’re not being fraudulently used. Finally, Paddy Power bookmaker are fully regulated by the UK’s Gambling Commission. You’d normally expect a hefty selection of payment methods from a big bookie. Paddy Power does satisfy this requirement to an extent… but it’s not the widest range of banking options we’ve seen. All of your old favourites are present and correct, including credit and debit card, bank transfer, PayPal, Neteller and Skrill. Apart from those heavy hitters, though, there are only a couple of other options – PaySafeCard, Cash Card, and Cash Card PPlus. Compared to the army of banking options on William Hill, for example, this is a pretty small selection. Still, given that the vast majority of people will deposit via credit card, PayPal, and so on, this isn’t really a big issue. 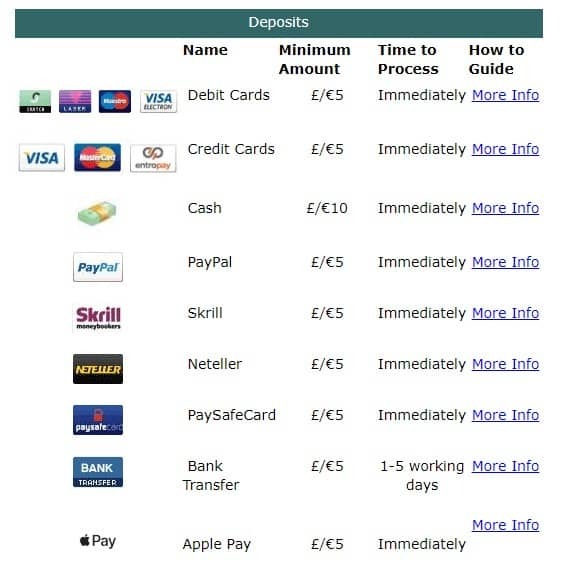 The minimum deposit amount is £5 for all payment methods. All payments are processed instantly except for bank transfers, which take 2-5 working days. Finally, a Paddy Power withdrawal can be made to any registered payment method, not just the one with which you deposited. The Paddy Power sign up process is quick, painless, and clearly laid out. Everything happens in one stage, on a single screen, and the entire procedure only takes a minute or two at most. Mostly, you simply enter the usual personal details – your name, date of birth, address, and so on. You’ll also need to create a security question, and you have the option to set up a deposit limit too. One important thing to note is that – when you’ve decided what your default account currency will be here – you can’t subsequently change it. That’s a little strange, but Paddy Power do flag it clearly. After you’ve finished entering your details, just click the big “Join Now” button, and your account will be created. Every punter has his or her problems, and it’s extremely important that a bookie has people on hand to help. The expectations are even higher for the bigger bookies in this regard, and rightly so. We’re pleased to say, therefore, that the Paddy Power customer service is exceptional. There are two ways to contact Paddy Power – by live chat, and by phone. They’ve actually stopped their email service now to focus on those two more immediate options, which is a bold but (we’d argue) smart move. In addition, there’s also a sizeable FAQ section. It looks a bit outdated compared to the rest of the website, but – beneath the surface – it’s extremely well put together. The sections are arranged smartly, and the search engine works quickly and effectively. You don’t have to be Sherlock Holmes to work out that Paddy Power is an Irish company. They were originally founded in Dublin back in 1988, as the result of three other major Irish bookies merging together. Since that merger, Paddy Power have generally stayed pretty independent. Their first major acquisition was Sportsbet.com.au in 2010, and – in 2016 – they also acquired major British bookie Betfair (technically they own 52% of the overall company). By most measures, Paddy Power Betfair is the third biggest bookie in Britain now. It’s listed on the FTSE 100, and pulled in a revenue of £1.75 billion in 2017. They still operate some 600 physical betting shops in the UK and Ireland, and have over 7,500 employees on their books. At the beginning of this Paddy Power coverage, we asked a couple of questions. 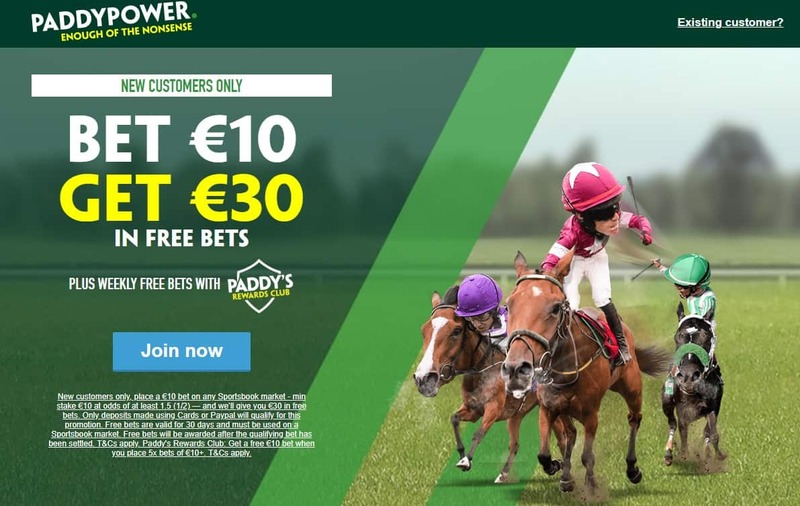 Does Paddy Power have the substance to back up the style of its marketing campaigns? Is it worth choosing over many of the other options out there? Paddy Power delivers everything you could ask for from a modern bookmaker. From their extensive and enticing promotions, to their exceptional mobile app, to their in-play streaming service, this is a high quality package from top to bottom. Literally the only criticism we could muster regarded the appearance… and you get acclimatised to that within a few minutes. Whatever you’re looking for in a bookie, we can almost guarantee that Paddy Power delivers it. There’s absolutely no reason not to sign up for their super-safe £10 Risk Free First Bet offer now, and try them out. You won’t be sorry.